Screenplay: Debra Granik, Anne Rosellini. 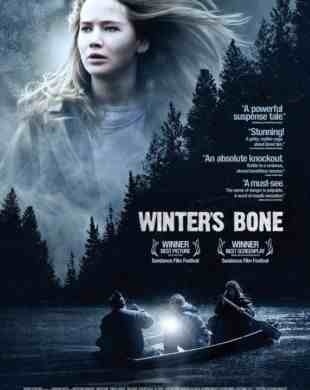 Starring: Jennifer Lawrence, John Hawkes, Sheryl Lee, Garret Dillahunt. Being able to experience another culture or catch a glimpse of a person’s lifestyle without physical involvement is one of the wonders of cinema. Thank our lucky stars for celluloid then, as it allows us the luxury of paying a visit to the stark and violent backwoods of America and still able to walk away from it. It’s a place I’d rather not have to endure, as this film so vividly confirms. Seventeen year-old Ree Dolly (Jennifer Lawrence) sets out to track down her bail-jumping dad after he uses the family home to secure his bond. Failing to find him will mean that she, her mother and siblings will have to fend for themselves in the bitter Ozark woods. Overcoming her kin’s code of silence and threats of retribution and violence, she slowly uncovers the truth behind her father’s disappearance. The lives of the characters in this film are as barren as the landscape. The environment is unkind which in turn manifests itself in the inhabitants. They are a product of their environment and this unsavoury bunch and their lawless community are perfectly captured by director Debra Granik and cinematographer Michael McDonough. Good performances too, by the Oscar nominated newcomer Jennifer Lawrence (who reminded me of a young Juliette Lewis) and John Hawkes (“From Dusk Till Dawn”) finally getting a role suited to his abilities. However, as much as I enjoyed this, I feel the critics have praised it just a bit too highly. In their numbers, they lapped this one up and I struggle to see why. It certainly looks the part and the performances are excellent but it’s a tad lethargic, considering the main character has a deadline to meet. Other than the novelty and voyueristic setting of a neo-noir in the desolate backwoods, It didn’t offer anything new and I must admit that I found myself drifting off a few times. It failed to hold my attention for its entirety, only occasionally jolting me back to attention with a few memorably powerful scenes. A fine feel for the place and the people but having had very high expectations going into it, I can’t help but feel that I’ve been a victim of hype. This entry was posted on January 12, 2012 at 1:35 am and is filed under Drama, Mystery with tags 2010. You can follow any responses to this entry through the RSS 2.0 feed. You can leave a response, or trackback from your own site. Interesting review of the film, I have reviewed it on my blog if you are interested. Thanks again Vinnie. I’ll swing by and have a look.